The RCMP will bring in outside investigators to look into any future allegations of harassment and bullying inside the force, addressing long-standing concerns that victims did not always get a fair hearing when their complaints were investigated by fellow Mounties. The new process will come into place later this year, after the RCMP starts working with a new civilian advisory board that will aim to improve management practices inside the national police force. At a news conference on Wednesday, Public Safety Minister Ralph Goodale and RCMP Commissioner Brenda Lucki announced a 13-member interim board of management will be created by April 1. The board will become a permanent advisory body after Parliament adopts amendments to the RCMP Act. 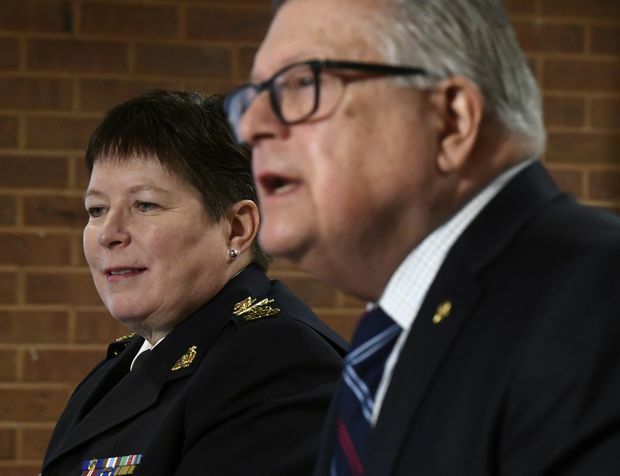 RCMP Commissioner Brenda Lucki, left, listens as Minister of Public Safety and Emergency Preparedness Ralph Goodale addresses a news conference on the RCMP's new Interim Management Advisory Board, in Ottawa, on Jan. 16, 2019. “It’s really important that our process is transparent and fearless so that people can feel safe, victims can feel safe to come forward, in a process in which they won’t be revictimized,” she said at a news conference. In a report released in 2017, the Civilian Review and Complaints Commission for the RCMP (CRCC) denounced the fact that harassment complaints inside the force were handled by uniformed Mounties. Former auditor-general Sheila Fraser, who wrote a report in 2017 on the handling of sexual harassment complaints in the RCMP, said the new board will help to improve the workplace culture. “The RCMP is a very insular organization and I believe that a management board will provide the Commissioner with relevant advice on modern management and ensure that the actions announced today are successfully implemented,” she said. Mr. Goodale said the priority for the RCMP advisory board will be to improve the health and well-being of the members of the RCMP. Over time, the board will offer insight into other management issues, including recruiting, information technology and financial management at the RCMP. “This is not a management board for harassment, this is a management board for the total function of the police force. It started with the issues related to human resources and the well-being of the workplace … but its function is much broader than that,” Mr. Goodale said. Kent Roach, a professor of law at the University of Toronto, said he hopes the new management board will eventually have an impact on the way that the RCMP handles its policing mandate across the country. To create a permanent board, the government will introduce legislation in the House in coming weeks to amend the RCMP Act. Mr. Goodale said it will be clear in the legislative amendments that the new board will offer input on administrative issues but will have no authority over RCMP operations and investigations.